People aren’t shy about telling you that a baby will change your life. There will be great changes—Watching them develop! The smiles! The belly laughs!—and there will be less than stellar changes (namely, sleep). Something I really didn’t feel prepared for? The very adult decisions that needed to be made. Yes, I knew that we needed to decide basic things like where the baby would sleep and what we’d name him. But there were a lot of other decisions I didn’t know we’d need to make so quickly. 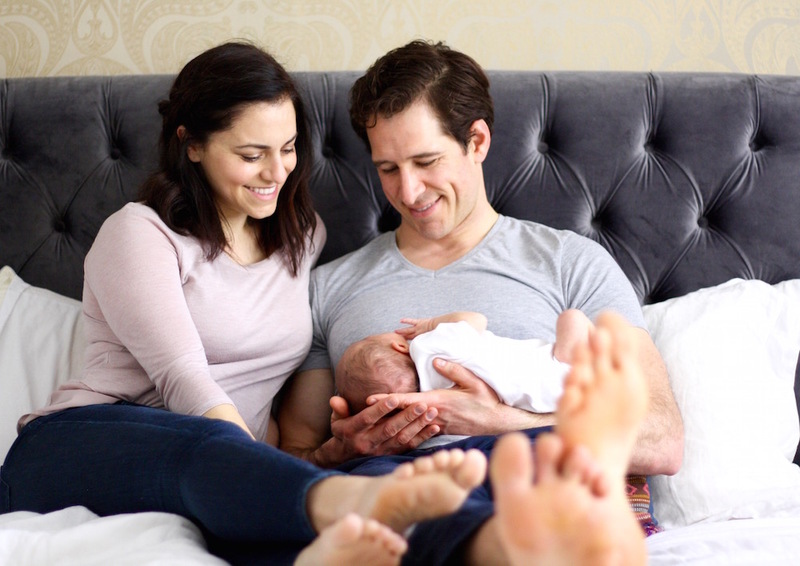 When Henry was born in March 2018 we experienced every blissful emotion for the first few weeks. But when the newborn period ended, we realized we had some big choices coming our way—quickly. Here are five of the most important decisions we faced, and how we approached them. Jordan and I have always had life insurance, but it was for a pretty paltry amount of coverage through his employer. Once we had a baby on the way, we knew it was time to re-examine our policies. Rather than increasing the coverage we got from his employer, we decided to look around and see what other options there might be out there. Our first attempt was a complete flop. We entered our info online and within minutes we had multiple agents calling us trying to make the sale. Overwhelmed, we hit pause and decided to pay for a little extra coverage through Jordan’s employer until we could figure things out. A few months after Henry was born, I decided to take another look at life insurance. We still felt underinsured and we didn’t like having our life insurance tied to Jordan’s employment. This time, instead of reaching out to different brokers again, I found a new option: Ladder. We knew we wanted the following: term life insurance (which is what Ladder offers), an easy process where we felt in control, and zero pressure to sign up for a certain amount of coverage (because their insurance professionals work on salary, not commission). Ladder fit the bill. We filled out the application online in minutes and had instant, temporary coverage. A few weeks later we completed the in-home lab exam and shortly after that, our 25-year insurance plan was put into place. Honestly, I didn’t even know how much the stress of being underinsured was weighing on me until we completed the process. Not sure if you need life insurance? You can read this post. And if you want to read the full details of our experience with Ladder, you can read that here. And if our needs change down the line? Ladder offers the flexibility to apply for more or less coverage just as easily. Like life insurance, this falls in the “I never want to think about this” category. Also, like life insurance, it’s in the “this was easier than I thought” category. Naming a guardian was really important for our peace of mind because we wanted the security of knowing that if anything terrible were to happen to us, Henry would be immediately taken care of with a stable situation. We named a guardian around the same time we were getting life insurance, like ripping off an uncomfortable-feelings Bandaid. We feel very fortunate that we both are very close with our families, so we had a lot of people that we knew would step up if needed. After a few quick discussions, we chose a guardian and made an appointment with a lawyer to make it official. At the same appointment we had the lawyer create a trust for us, so all of our legal action items were crossed off. Phew. And side note: Jordan’s employer actually paid for the trust creation! It’s one of those random employee benefits that you don’t know are offered until you look. If you’re looking into creating a will or trust, check with your employer first to see if they offer any type of reimbursement. Once Henry was born we realized there was one big financial uncertainty: college. Will he attend? Where will he want to go? How much should we pay for? Will college be a thing of the past in 18 years? Will the price keep skyrocketing? Jordan and I were both very fortunate to attend a state college and have our families pay for the majority of our education. I didn’t realize how lucky I was until I financed my own way through business school and amassed $120k in debt. When we thought about how we would handle college for Henry, we were a little conflicted. Before he was born, we figured that we might want to save up for Duke, which is where both Jordan and I went for our MBAs. If he wants to go there, we should absolutely support that. Right? Well….maybe not. When we decided to run the numbers, things got real. If we wanted to save for private school tuition, we’d likely need to save more than $1,000 per month. Could we make that work? Yes. Would we sacrifice our retirement? Also yes. We landed on saving for Henry to go to an in-state public college and putting away money monthly in a 529 plan. Like most parenting decisions, we don’t know if this was the right choice, but it was the right one for us, right now. This was probably the most difficult for us to be decisive about. And if I’m truly honest, even though we’ve made our childcare decisions, I still have moments where I waiver. When we first sat down to make our childcare budget, we did so with the idea that the cheaper the childcare, the better. We took into account our different savings goals and price shopped different nurseries in the area. The plan was for Henry to attend three full days a week and I’d go back to work part-time. That plan didn’t fly for long. I decided that I wanted to go back to work full time, but that meant finding—and paying for—full-time care. After looking at how much more I can earn by taking on full-time work (which is pretty variable for a freelancer) and the different childcare options in the area, we created a few different budgets. We came up with three options: least expensive (but still not cheap because childcare is crazy expensive), a mid-range option, and a very expensive option. As a protective parent, I was ready to sign Henry up for the Cadillac option and basically spend my entire income doing so. Jordan preferred the bargain basement option. After weeks of discussions, we landed on a modified version of the mid-range option and have a healthy childcare budget that we both feel comfortable with. A big hesitation of mine before becoming a mom was how Jordan and I would split household care. I’m fortunate to have a very involved, progressive partner, but we’d both read all of the research that says a woman ends up taking on a majority of the household and childcare duties after starting a family, even if she’s working. I was worried that with my flexible work schedule, the bulk of the work at home would fall on my shoulders. We both read books and blog posts that claimed to have the answer to balancing it all. We talked about our strategy and exactly how we would divide up the chores. Then, Henry was born and like with everything else, our plans went out the window. We had a lot of conversations over the first few months, but eventually, we found a solution that works for us for now. The first decision we made was letting go of the idea that things would be split 50/50. Nothing will ever be completely even, but as long as we’re each getting what we need, it doesn’t work for us to keep score. But, we still work to keep some balance. With my flexible work schedule, I’m home more, so I make dinners during the week and order our groceries. On the weekends Jordan makes our meals, as well as takes the lead on the food prep for the upcoming week. I’m the point person for our childcare, but Jordan is the point person for any of Henry’s paperwork (being an expat, there is a lot of paperwork). And I take care of Henry in the morning and get him ready for the day and Jordan does the night routine after dinner. It’s not a perfect split, but deciding that good is better than perfect has helped us find the right rhythm. This post was written in partnership with Ladder, however, all opinions are my own. Jordan and I are both Ladder insurance policyholders and happy customers. We did not receive anything in exchange for applying or becoming a policyholder. I only share products and companies I use and love.